We live in a society of tired and worn out people. 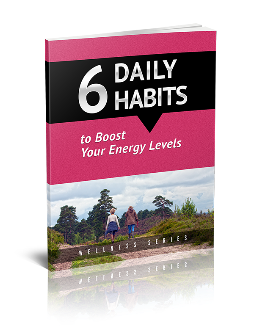 Many people have desk jobs or sit around all day, which, while not using much actual energy, tends to make us feel zapped and more tired because physical movement begets energy. We run around from work to chores to home where we face more chores without the needed energy to accomplish these tasks. On the weekends we are stuck to gaming systems, television screens and spend little time in the fresh air. We spend time wishing we had more energy. In addition, we take unhealthy shortcuts by downing Red Bull energy drinks to keep us going, not realizing that these drinks contain high amounts of sugar and caffeine that have landed many people in hospital emergency rooms. The energy drink industry, which nets an estimated $10 billion per year is resulting in a rising number of patients, many of whom are young, being treated in emergency rooms for serious complications related to the high intake of caffeine in drinks like 5-hour energy, Monster Energy and of course, Red Bull. Make sure there isn’t something physically wrong. Pay attention to the medications you are taking. While it would seem logical that exercise would make fatigue worse, actually the opposite is true. Being physically active tends to boost your energy levels, not to mention maximize the function of many of your body’s organs. Exercise can help you lose weight, which can further significantly increase your energy. According to the President’s Council on Fitness, Sports & Nutrition, less than 5% of adults participate in 30 minutes of physical activity each day. More than 80% of adults do not meet the guidelines for aerobic activity that is known to increase energy and vitality, especially as we age. My Fitness App, Z FIT, is like having a Personal Trainer in your hip pocket. Keep a water bottle filled and chilled for more energy by fighting dehydration. Research on athletes has shown that being dehydrated zaps the energy from their activity. Even if you’re not athletic, staying hydrated with water will give you that added bit of energy you deserve. The best way to get enough sleep is to go to bed early and get at least 7-9 hours of sleep. In one 2004 study, it was found that people who got adequate sleep were more vigorous and reported less fatigue. Naps are other ways to freshen up your energy level. Try for short naps, no longer than 30 minutes. Any longer than that and you will have difficulty sleeping during the night. One study showed that a nap followed by a small quantity of caffeine such as a 5-ounce cup of coffee or tea can restore your energy even more. Fish oil capsules are good for you in many ways. One way, as shown by a 2009 Italian study, to boost energy and have quicker mental reaction times, is to take fish oil capsules containing omega 3 fatty acids. The capsules also restored physical vigor. Become aware of your personal circadian rhythm. Carrying around extra weight can be exhausting and the only way to rid yourself of that exhaustion is to start a healthy exercise and diet program that will help you shed pounds and feel more vigorous. There are no specific diets that work any better than creating a calorie deficit and working out at least 30 minutes per day. Large meals zap you of energy because the body needs to use a lot of energy to digest them. Think about a time you ate a buffet, where everyone naturally eats too much food, versus a meal that included a salad. More likely than not when you left the buffet you felt exhausted and wishing someone would wheel you out of there, versus the energy you felt after a raw whole food meal such as a salad. Small and frequent meals will keep your blood sugars from fluctuating, giving you steady amounts of food energy throughout the day. My Nutrition App, Z Nutrition has over 50 different meal plans, designed by Registered Dietitians, to help you achieve a healthy eating lifestyle.